In addition to receiving a rigorous and stimulating classroom experience, North Carolina Central University (NCCU) School of Law students have the opportunity to enhance their educational experience by participating in organizations. Student organization members share unique talents, interests, skills, and goals enriching the lives of each other and the School of Law. On-campus and off-campus co-curricular activities and competitions allow NCCU School of Law students to develop and hone verbal and practical skills. NCCU School of Law is a student-oriented environment. Students play an integral part in the governance of the school. In addition to membership in the Student Bar Association (SBA), selected day and evening students participate on faculty and administrative committees, providing invaluable insight and ideas. The mission of the African Law Students Association is to unite African law students and student interested in issues concerning Africa. Our goal is to educate the community on social, economic, political and legal issues that are facing the continent. Throughout the year, this organization will promote cultural awareness and provide support for students. In 1968, Algernon Johnson founded what was later the Black Law Students Association (BLSA) at the New York University Law School. 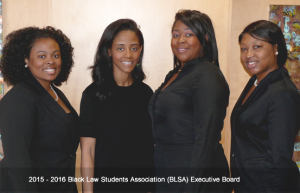 The NCCU School of Law Chapter of BLSA is named the Lemarquis DeJarmon-Daniel George Sampson Chapter. BLSA seeks to articulate and promote the educational, professional, political and social needs and goals of Black law students; to foster and encourage professional competence; improve the relationship between Black law students, Black attorneys, and the American legal structure; instill in the Black attorney and law student a greater awareness and commitment to the needs of the Black community; influence the legal community by bringing about meaningful legal and political change that addresses the needs and concerns of the Black community; adopt and implement policies of economic independence; encourage Black law students to pursue careers in the judiciary, and to all things necessary and appropriate to accomplish these purposes. In the fall of 2017, the Biotechnology and Pharmaceutical Law Review (BPLR) transitioned into North Carolina Central University Science and Intellectual Property Law Review (SIPLR). SIPLR is an open forum for the publication of any appropriate legal writing offering diverse views on Science and Intellectual Property Law. SIPLR primarily consists of lead articles and student materials that give particular consideration to new or evolving subjects of the law in these areas, and attempts to focus on issues relating to the state of North Carolina. The CLS is an organization of students who share a common interest in integrating their faith and the practice of law. The mission of the Floyd McKissick Senate of Delta Theta Phi is to unite students, alumni, and members of the legal community in the mutual advancement of professionalism and career development. Through building social capital and professional networks that promote ever member of this Fraternity, of this law school, community and bar, The Floyd McKissick Senate will work to empower members with the professional capacity to effectuate the overall objective and purpose of the Fraternity. The Environmental Law Society provides law students with the opportunity to gain valuable experience in the areas of environmental law and policy. The Federalist Society for Law and Public Policy Studies is a group of conservatives and libertarians founded on the principles that the state exists to preserve freedom, that separation of powers is central to the Constitution, and that it is emphatically the province of the judiciary to say what the law is, not what it should be. There is a Student Chapter of the Federalist Society at NCCU School of Law. The vision of the Future Lawyers for Community Advancement is to enhance our communities by demonstrating excellence and motivating others to strive for excellence in the legal profession through public outreach programs, mentoring and scholastic opportunities. HLSA works to increase awareness about issues affecting Hispanic-Americans and the legal profession. The NCCU Innocence seeks to provide opportunities for its members to gain legal skills by partnering with the NC Center on Actual Innocence to review, investigate, and make recommendations on innocence claims made by prisoners incarcerated in North Carolina. Members will present the results of their research and make recommendations to the Center. The Intellectual Property Society serves two functions. One, provide students a forum to discuss and explore current and relevant intellectual property law with colleagues. Two, give students an opportunity to network within the larger intellectual property law community of this area. The ILS provides a forum for education and discussion about international issues that face the legal community. The purpose of ILS is to encourage education and discussion about important legal issues that face an increasingly interconnected globe. ILS encourages students to pursue knowledge and understanding of the vast and diverse global legal community. ILS hopes to accomplish this forum by means of discussion, debate, seminars, guest lecturers and so much more. LSRJ is a non-partisan, non-profit network of law students and lawyers committed to fostering the next generation of legal experts that will emerge prepared to protect and expand reproductive rights as basic human and civil rights. The Moot Court Board, administered by a student-elected Moot Court Board, is composed of law students who have demonstrated exceptional ability in appellate skills gives law students the opportunity to develop practical skills in legal research and writing, client counseling, appellate oral advocacy, and negotiation. The Moot Court Board sponsors in-house competitions as well as teams that participate in competitions held throughout the United States. NALSA promotes awareness about issues affecting Native-American law students, and promotes broader cultural understanding of issues affecting Native-Americans. The NCCU Law Chapter of the National Lawyers Guild (NLG) is a student association dedicated to the support and defense of economic and social justice, and to progressive change by way of empowering both students and community members with skills and knowledge of the legal system. We seek to educate ourselves and our communities about economic, social, and legal issues, provide law students with pro bono opportunities in support of these goals, and increase awareness in the NCCU School of Law community of local and national issues surrounding economic and social justice. We seek to unite lawyers, law students, legal workers and jailhouse lawyers in an organization which shall function as an effective political, social, and legal force in the service of people. In so doing, we strongly believe that economic equality and social justice are basic human rights that deserve both protection and expansion. The Animal Law Society is dedicated to the goals of educating the law school community and surrounding community about forms of institutionalized animal abuse, and engaging in projects that combat that abuse. The Review shall publish at least twice each year a volume that presents scholarly articles for the edification of the legal community. The Review is intended to be an open forum for the publication of any appropriate legal writing, offering diverse views on the law. All students at the North Carolina Central University School of Law are encouraged to submit original legal writings for publication in the Review. The Review shall primarily consist of lead articles and student materials that five particular consideration to new or evolving areas of the law and problems facing our nation’s minorities. In addition, the Review shall focus on issues relating to the state of North Carolina. The NCCU Outlaw Alliance serves to provide and promote a safe and supportive environment for all LGBT members of our law school community by providing a forum for discussion of the issues, and the opportunity to establish contacts with other LGBT and heterosexual students who support legal equality for LGBT individuals and families. The group seeks to inform and educate the NCCU Law School community on the current legal challenges facing lesbian, gay, bisexual, and trans-gendered (LGBT) individuals and families. Phi Alpha Delta, the world’s largest law fraternity, is a professional service organization serving law students, law schools, and the legal profession. The purpose of this fraternity shall be to form a strong bond uniting students and teachers of the law with members of the Bench and Bar in a fraternal fellowship designed to advance the ideals of liberty and equal justice under law; to stimulate excellence in scholarship; to inspire the virtues of compassion and courage; to foster integrity and professional competence; to promote the welfare of its members; and to encourage their moral, intellectual, and cultural advancement; so that each member may enjoy a lifetime of honorable professional and public service. By furthering our mission, we will plan a social, academic, alumni, service and professional event each semester. Our events promote networking among law students, law professors, alumni and other legal professionals. Phi Delta Phi’s mission statement is, “to promote the highest standard of legal ethics and professionalism in law schools and the legal profession.” Our Inn is known as Turner Inn of Phi Delta Phi. Turner Inn was established to promote the highest standards of legal ethics and scholarship amongst its members, its alumni and others who may be enrolled at the North Carolina Central University School of Law. Goals for this year include a successful recruitment of new members, continuing the tradition of helpful community service projects, and promoting commodore between members and the general student body academically and socially. PILO facilitates a network of support for students interested in pursuing public interest law, raises awareness of public interest law within the law school community and encourages all students to engage in pro bono service during law school. PILO seeks to promote an atmosphere of intellectual debate and learning by sponsoring quality programming and educational opportunities dealing with public interest law. The purpose of this organization is to provide a forum for education and discussion about sports and entertainment law. SELS also strives to facilitate contacts within the sports and entertainment industries by keeping members abreast of upcoming conferences and forums on both the local and national levels. The SBA serves as the governmental voice of the student body and is advised by the Assistant Dean of Student Affairs. The SBA is the liaison between the student body and the Law School administration and faculty, and furthers professional and social interest among all students enrolled in the Law School. Evers student is a member of the SBA. The SBA’s budget is used to support the programs of the SBA as well as the programs of the other 29 law school organizations. Primary activities of the SBA include participation in our new student orientation program, the annual Law Week celebration, and graduation. The Trial Advocacy Program, administered by a student-elected Trial Advocacy Board, is a program in which students have the opportunity to gain skills and experience in trial and litigation techniques. The Board sponsors in-house competitions, and also sends teams to various competitions around the country. NCCU trial teams have received national recognition. The Women’s Caucus provides an opportunity for personal and professional development, and also provides a forum for discussion of issues related to women in the legal profession and in the judicial process. The WLC acknowledges the contributions of women in the legal profession who balance academic, professional, and personal responsibilities. While our primary focus is on the development of women, our organization seeks to enhance the development of women and men as law students, leaders in the legal profession, and as responsible members of the community. WLC sponsors events and networking opportunities that not only foster the relationships within the law school, but also with other professional organizations outside of the law school. WLC sponsors programs annually such as the Female Judges’ Forum, Women’s Tea, and Politics and Grits.